This year at Summit Racing Equipment Atlanta Motorama alongside vintage vehicles and cool customs you’ll also find an extreme machine that has just one purpose: go fast. Very fast. 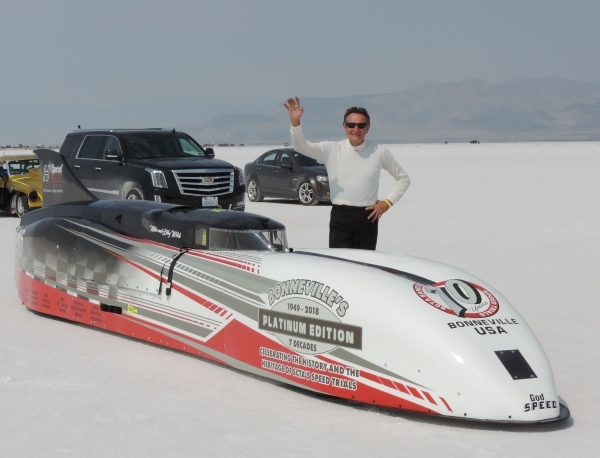 During Motorama weekend the Million-Dollar Salon will be the temporary home of this Bonneville Streamliner, but as its name suggests the car is most at home on the salt flats. “Bonneville is obviously the land speed record location in Utah, recognized worldwide as the mecca of speed for those who want to go really fast,” said Mike Welch, who’s been making the pilgrimage to Bonneville for nearly two decades. Over the years he’s brought several different cars as he’s chased higher and higher speeds, and recently put together a Streamliner to take his top speed potential to a whole new level. Welch says he was always intrigued by the speed runs across Bonneville’s salt flats that he read about in hot rod magazines as a child, but initially scratched his itch for high-velocity driving by drag racing. Over time Welch’s desire to reach higher speeds started to outgrow the dragstrips. This was noticed by his wife Libby, who encouraged him to make a trip to Bonneville and see if the speed runs he saw in those magazines, offering miles of flat salt land to rocket across, could be the next step. With that suggestion Welch made his first trip to Bonneville in 1998 as a spectator. A couple of years later he went back, this time with an oval-racing car he’d modified for the salt flats and instantly was hooked. “While drag racing is purely acceleration, Bonneville is momentum,” Welch explained. “You’re pushed out to a speed of 40 to 50 m.p.h. just to get the car rolling and you take it from there. Within a minute, whatever your speed capabilities are, you’re there. You have five miles to work with and that gives you the opportunity to drive the car significantly. Welch says the original plan was to eclipse 200 m.p.h., declare victory and move on, but two decades after that first trip to Utah, Welch is still trying to go faster. That tug of the soul led Welch to build the Streamliner; a purpose-built machine, born as a concept in Welch’s mind and made a reality thanks to hard work, determination, and some good advice along the way. When he brings the Streamliner to Summit Racing Equipment Atlanta Motorama, Welch will be sharing the result of a life-long passion. Welch’s Streamliner will be one of more than 1,000 vehicles on display during Summit Racing Equipment Atlanta Motorama, which returns with a weekend chock-full of cars and events on April 27-28, 2019.